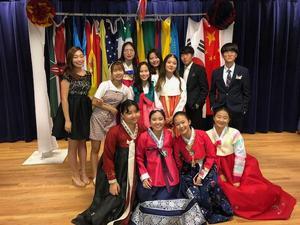 Students, staff, and guests gathered at the annual International Banquet to celebrate their heritage and learn about the cultural traditions of others. It was a wonderful evening filled with great food and entertainment from the various countries represented by our students. Giving Tuesday - TODAY is the Day! We are participating for the third year in #GivingTuesday on Tuesday, November 27, 2018. Join us as we seek to raise funds this year to support our Eagle Athletic programs. This school year began with a splash! On Saturday, August 18, the Campus Ministry Council hosted the annual "SPLASH" event to help our newest students become acquainted with other students on campus. Even though the temperatures reached 100 degrees, students stayed cool with various water games and had fun welcoming everyone into the Pan Am family. Forty-eight graduates walked the stage on Saturday, May 19, and received their diplomas. Congratulations to the PPAS Class of 2018, and best wishes for a bright future! Check out this special graduation edition of the "Eagle X-Press" student newspaper and read all about the PPAS "Class of 2018" and their future plans. All of our students enjoyed a wonderful prom on Saturday, April 21. As is our tradition, the junior class planned and decorated for the dance in honor of the senior class. Seniors Antonio Ruiz and Ana Cecilia Quiroga were voted 2018 Prom King and Queen. 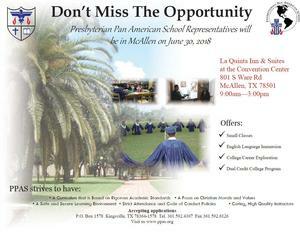 Our graduating seniors were recognized in a special church service on Sunday morning at First Presbyterian Church, Kingsville and were treated to a wonderful fellowship lunch afterwards. We are so blessed and thankful to have faithful church congregations who support our students! After TOEFL testing in the morning, students participated in a campus-wide Science Symposium in the afternoon. Instead of the traditional science fair with projects and experiments, students researched a wide variety of topics and presented their findings to the judges. Final results from the competition will be announced at a later date.